Renthal front sprocketss are simply the finest front sprocket on the market today. Our Front Sprockets feature a specially developed Nickel-Chrome-Molybdenum steel which is case hardened and core refined to give the ultimate combination of strength and hardness. Case hardened and core refined 655M13 Nickel-Chrome-Molybdenum alloy steel to give the ultimate combination of strength and hardness. Certain models available in factory ultralight design to further reduce weight and maximise performance. Most offroad fronts feature self-cleaning mud grooves between every tooth on both sides help prevent dirt build up. Renthal are precision manufactured for maxmium strength. 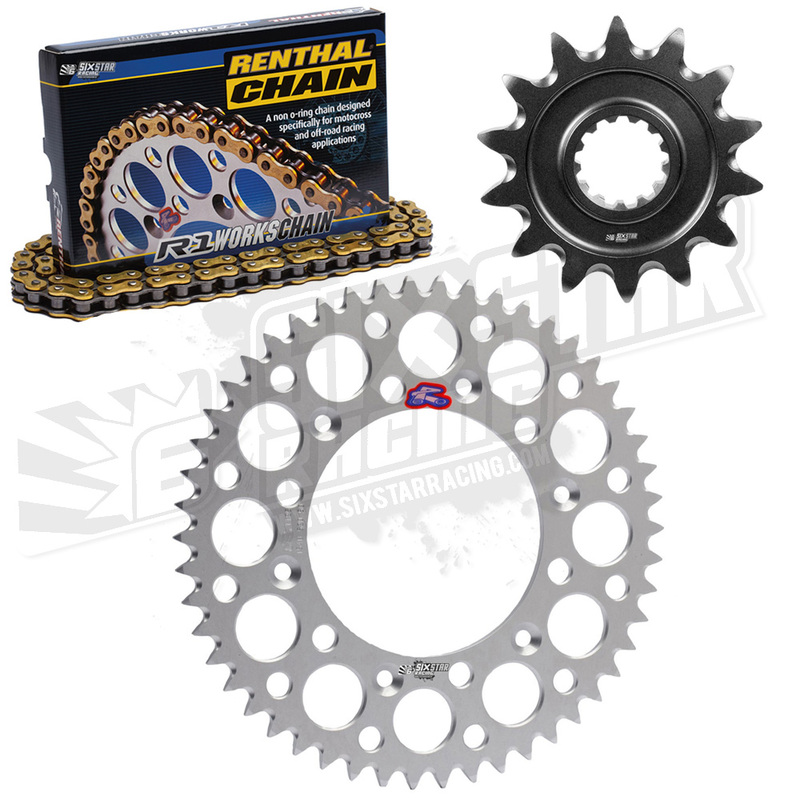 The Renthal 520 R-1 Works Chain is designed specifically with racing applications in mind. With the shot peened link plates giving the chain a 7,644 pound tensile strength, it’ll handle every bit of power when you pin the throttle. Longevity is taken care of by the chromized pins and corrosion-resistant gold finish that everybody loves. Chamfered inner-links keep the chain on the sprocket and prevent hop-offs, and with pre-formed bushings that extend between plates to reduce friction, the R-1 Works Chain won’t have a problem keeping your back tire spinning.